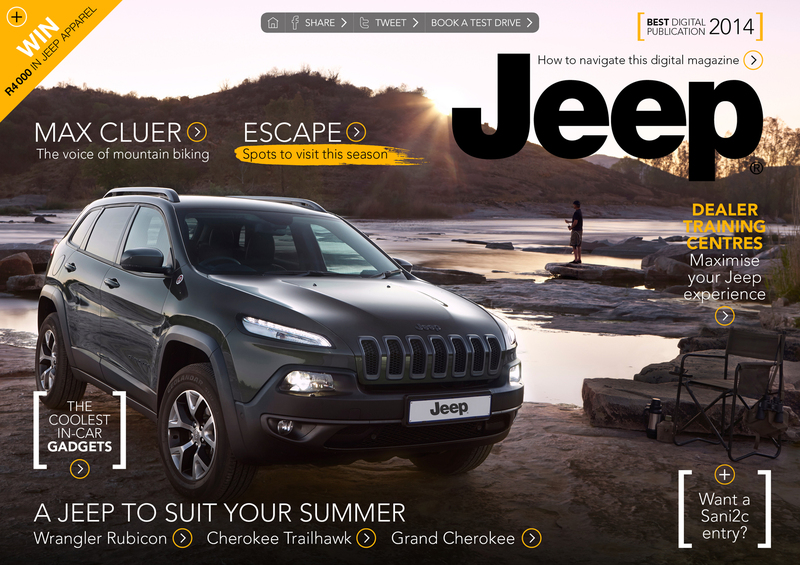 When Jeep Digital South Africa give you a call to photograph their cover, you quietly get a little overexcited. 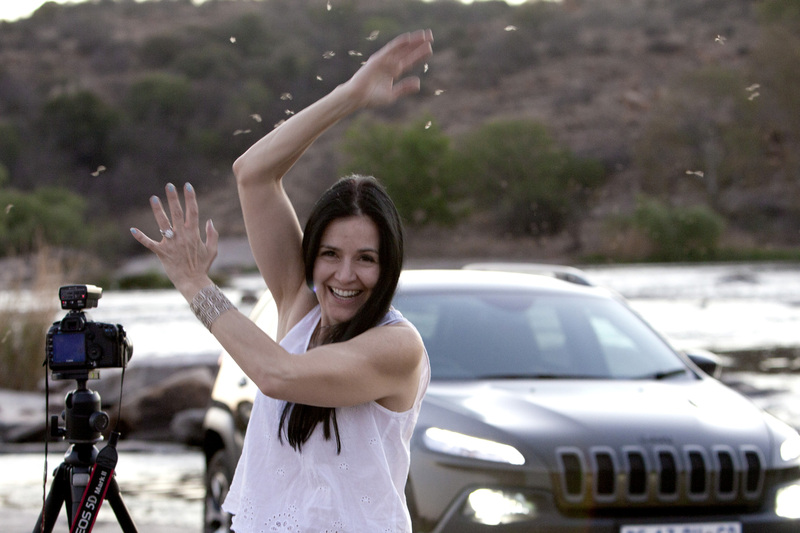 Obviously, this means I will be shooting a Jeep – and since I am such a fan I’m thinking, pick me! You have come to the right place. The shoot involves the new Trailhawk. I am virtual-chandelier swinging while I compose myself. The brief: take the Trailhawk to an outdoor location, where there is a dam or close to a water body and set up a leisure activity such as fishing. ‘Sure, no problem,’ I say, with my mind racing to all corners of the nearby landscape. The Trailhawk is in Johannesburg. I set-off to do some research and to find the best spot. There is a tight deadline, so it will have to be done at the weekend. 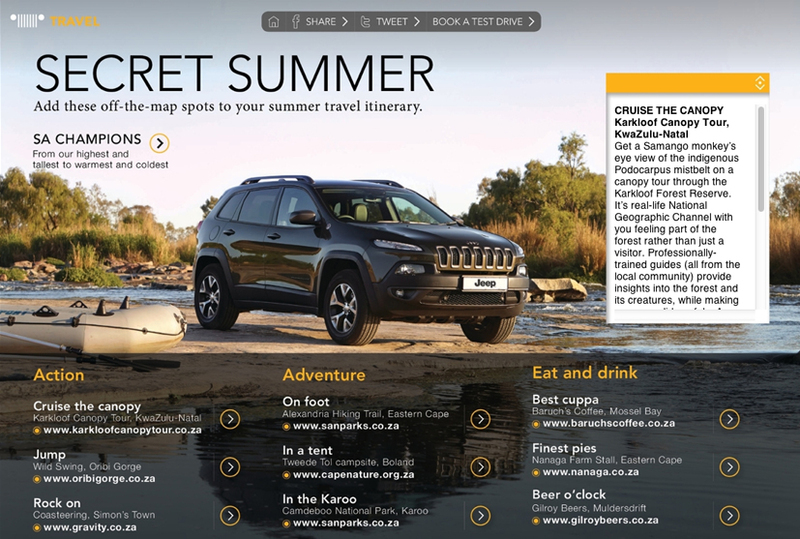 Do I mind, not at all I will just have to turn it into a getaway adventure. There is pressure, of course, to find the right location and to meet the client’s expectations. 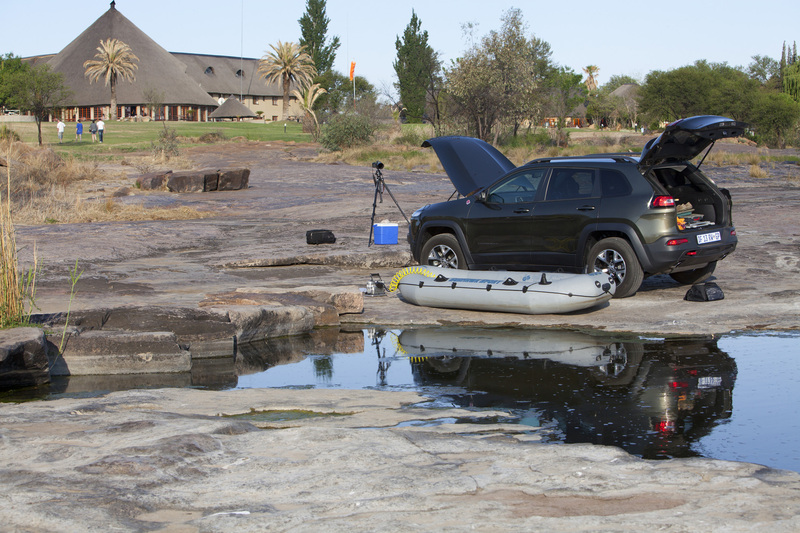 After eliminating most of the Johannesburg outdoor natural dams and leisure spots I realize the best place will be the Vaal River. 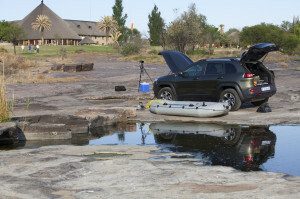 I collect the Trailhawk – what a magnificent beast; pack camping chairs; fly-fishing gear; blow-up boat; oars and anything else that I think may work to set the scene. A model will be required, so ‘husband’ is also packed in with a myriad of wardrobe options. 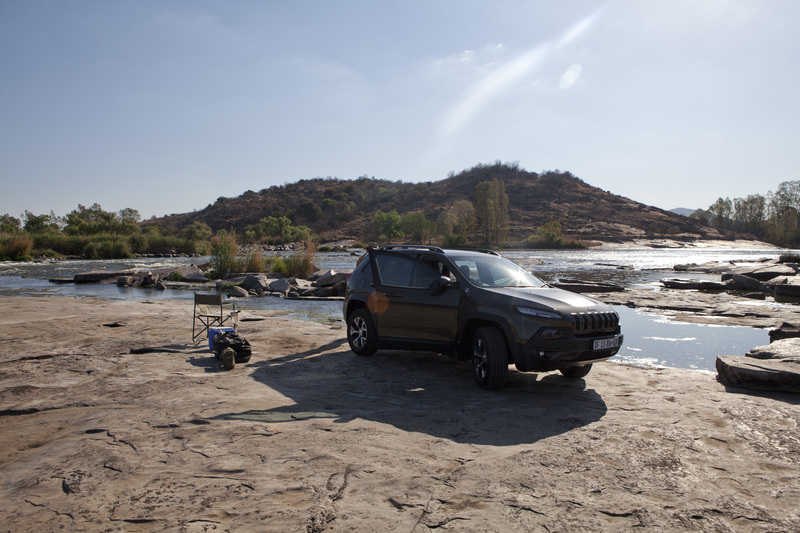 We book overnight accommodation at Stonehenge river-side lodge in Parys. With just an idea and an awesome challenge, we set off. Arriving after dark on the Friday night. We have to wait until the morning to scout. We get up at sunrise and explore. Miraculously, without our knowledge Stonehenge has the best access to the river. 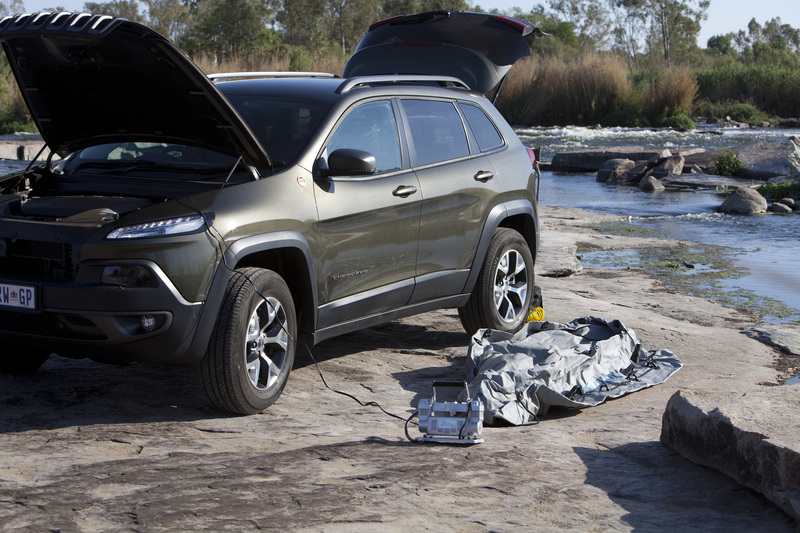 We can reach the water’s edge with the Trailhawk – fantastic. The sun is rising fast, so we will have to wait until the late afternoon for ‘softer’ light. There is another little glitch, we need permission from the lodge management to shoot there. If allowed, we will have to drive past their pool on their perfectly manicured lawn. We are apprehensive, holding thumbs we approach the front desk. Excited and relieved at getting the nod we are even more convinced that this is the perfect spot. We will have to wait until the light shifts and the sun drops lower. We don’t stop there, we go on to explore the length of the river, just to make doubly sure there isn’t another appropriate place. 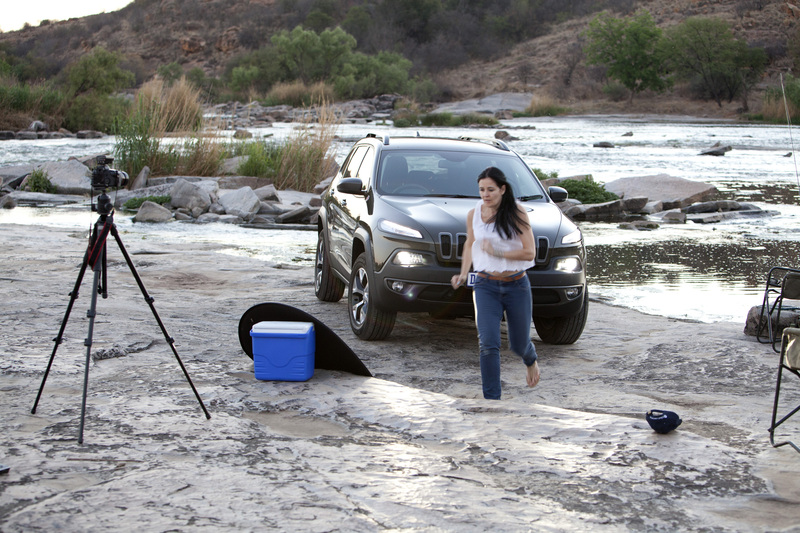 Convinced we landed the best location, we have the car cleaned and start prepping for the shoot. I set-up two possible angles, but because the light will change quickly as it nears sunset, I will have to work fast to ensure I get both options. 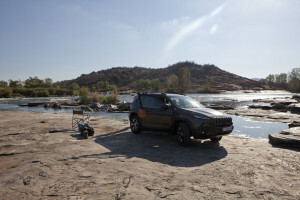 We park the car, and move it this way and that, once I am satisfied it is the best angle, we mark the area so we can re-park the Jeep in exactly the same place when the time comes. We inflate the blow-up boat, sort out the props, decide on the ‘wardrobe’ and the positioning of the items for both options. We patiently wait until the sun starts setting. We start with the first set-up, including options with and without my ‘model’ in fly-fishing-action. 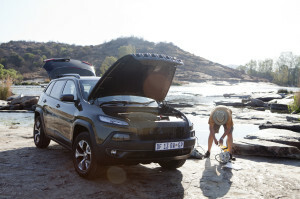 I have to ensure that we don’t leave anything in the shot that shouldn’t be there, that the Trailhawk windows are closed, that there are not fingermarks anywhere, that we shoot with the vehicle lights on and off – I make sure I have all the options. As the light starts dimming we move the car to the second set-up. The sun is about to set behind the mountain, just beyond. 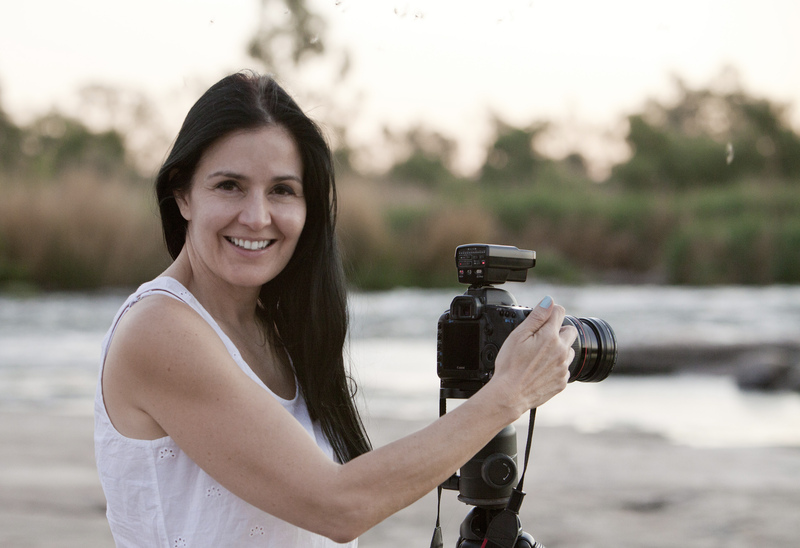 I am running back and forth trying to perfect all the elements in the shot, instructing the ‘model’ and then, at the last minute I decide to bring the chair closer to the camera. The insects are, now, out in full force. Before I know it, darkness engulfs us. We pack quickly. Headlights on, one last look around – the area is as it was when we arrived. Back in the Trailhawk we head off home, feeling rather satisfied.